I bit the bullet and upgraded my Windows 7 laptop to Windows 8. It is the first operating system I have ever purchased. In the past they usually just came pre-installed on my computer or from other people’s borrowed CD-R disks. 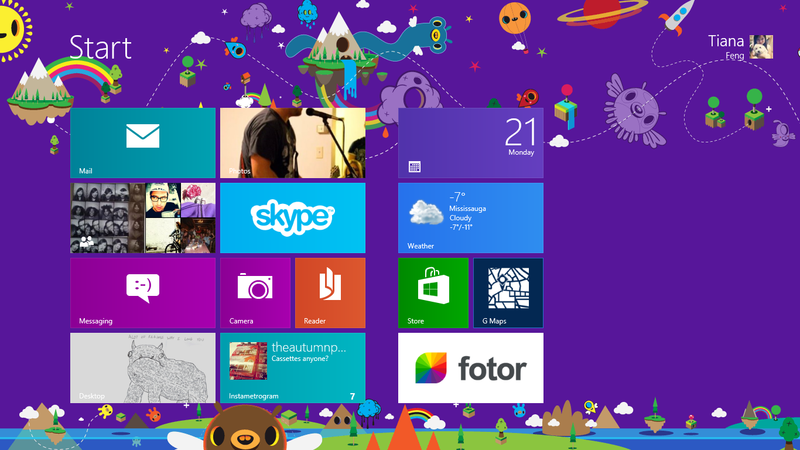 I have been using it for a couple of days now and I have to wonder why people are so frightened by Windows 8. The colour screen with the updating tiles can be thought of as a glorified smartbar with apps. Otherwise, it is a noticeably faster and smoother running version of Windows 7 with some new features. People are weird, they criticize Microsoft for not doing anything innovative to Windows and when they finally do something that looks different from Windows 95, it is the end of the world. What I really like about it is that you can replace the Desktop versions of software with the app versions that use less CPU. The app versions also “snap” nicely to the side of the screen so you can chat while working without the window disappearing. As an avid Windows user all my life, there was a bit of a learning curve. The first few minutes on the system I did have my panic attack moments. HOW THE HELL DO I CLOSE THIS APP?! and WHERE THE HELL IS MY PROGRAMS? were among the many questions I asked myself. However, through experimenting and looking up a dummy sheet on the internet I am quite integrated with the new system. I actually found myself quite productive on what is supposedly Blue Monday morning. So far, I love the new Windows 8 system. I bought a Windows 8 machine specifically to do freelance editorial work, and it scared the heck out of me at first. It’s taking some time but I’m getting used to it. I am not, however, noticing any sort of improvement in speed. Maybe that’s an HP thing though.